Brimming with confidence after his maiden Test hundred in England, young Rishabh Pant is now aiming to fine-tune his wicket-keeping skills at the NCA ahead of the two-Test series against the West Indies, starting October 4. Pant is likely to do simulation training in Bengaluru by keeping on tracks that offer turn in order to get ready for the decks that will be on offer in Rajkot and Hyderabad. "In India, the wickets are expected to be different from England or may be like the one at the Oval. I plan to to visit NCA before the series and keep on tracks where there will be roughs," Pant told PTI during an interaction on the sidelines of the Vijay Hazare Trophy. Chairman of selectors MSK Prasad, in a recent interview to PTI, said that they are trying to arrange for an exclusive keeping session for the youngster. "I am very happy that he (MSK Prasad) wants to help me out with my keeping. As a youngster, it is my duty to keep learning, improve at every given opportunity. That should be my endeavour," he said. Having kept against Ravichandran Ashwin, Ravindra Jadeja in the last three Test matches, Pant has got an idea as to what he needs to do while keeping up to spinners. "I have kept up to senior spinners (Ashwin and Jadeja) in the nets apart from the Tests in England. Like Oval strip, where Jaddu bhai was bowling, it felt like an India pitch. The ball was turning and on fourth and fifth day, there were spots," the 20-year-old recalled. Keeping in England wasn't easy but Pant said that he can't fight the perceptions that a scorecard can create by showing 76 byes against his name. To be fair to Pant, some of those deliveries bowled by the Indian pacers were way off target and no keeper in the world could have stopped those. "Obviously, you can get frustrated as a wicketkeeper. May be (all those byes) was not my fault but if someone is not watching the match, he would look only at the scorecard. Only those who saw the match would know that some of those were out of my reach. "Now on this issue, I can't debate or even reason with people whether I conceded those byes or not. It was part of the game," he said. Pant then explained some of the practical difficulties that a keeper may face in England where the red Duke ball swings even after leaving the stumps. "You need to cut down the angles (positioning) in England but then Indian pacers are a bit different from English pacers. The pace of our bowlers is more than English seamers. "All our bowlers (Ishant Sharma, Jasprit Bumrah and Mohammed Shami) consistently clock 140 plus and at that speed the ball comes with a wobbly seam once it leaves the stumps. I gave my hundred percent. But some of it was beyond my control and I would rather not speak about it." Pant felt that Ishant and Shami are two bowlers, whose deliveries wobble a lot as it comes to the keeper. His maiden hundred in Oval has earned him a lot of praise and Pant attributed it to "discipline" in his approach to batting. "My mindset has always been same for every match that I play. In the first two Tests, I got starts but couldn't capitalise on those starts. That day, I did the same things but I capitalised on the chances and was a bit more disciplined in my approach. 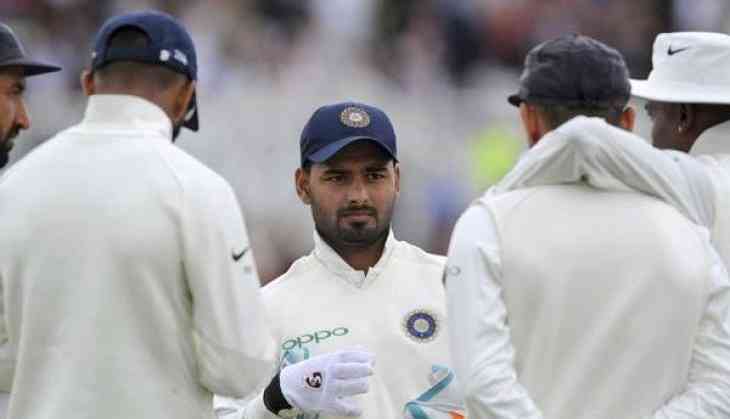 The result was a good partnership with KL Rahul," said Pant, who hit 15 fours and four sixes to become the first Indian keeper to score a Test hundred in England. India A coach Rahul Dravid had said before the England Test series that Pant has been able to mould his game according to situations. "I worked on my temperament and tried to curb my natural instinct to hit every ball. Rahul sir told me that the more quickly I can change my game as per situations, the better I will become as a player. That was the focus. "I implemented it during the India A ('Tests' vs England Lions) games and Rahul sir possibly saw that and reached a conclusion," he added. His coach Tarak Sinha is all set to be conferred with the prestigious Dronacharya (Lifetime) award by the President of India and Pant is delighted. "It's a huge moment for me personally that my sir is getting this prestigious award. In my mind, I used to think how can I produce such an impactful performance for India that no one can leave my sir out. I don't think any coach has produced 14 Test players (Manoj Prabhakar, Maninder Singh, Ashish Nehra, Aakash Chopra, Shikhar Dhawan, Pant to name a few)." Pant said that for Tarak sir, the satisfaction is only when his wards play Test cricket. "For sir, a good player is a Test player. It doesn't matter if his student has played T20Is or ODIs," said Pant. Pant, who will play the first three games for Delhi in the Vijay Hazare Trophy, slogged it out at the nets on Tuesday even as Cheteshwar Pujara and Ravindra Jadeja trained at the other net for Saurashtra. "When you come back to national level after performing at the international level, you certainly carry some confidence. Every match that I play, my focus is to play with hundred percent intensity unless I am injured," he concluded.